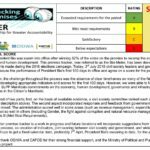 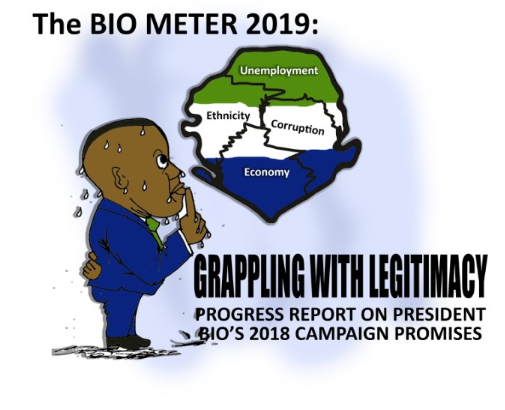 This report, commonly referred to as the Bio-Meter, is a citizen’s scorecard on the state of implementation of the various campaign promises made by President Bio during the run-up to the March 2018 elections. 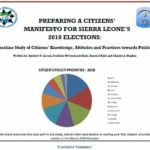 This report provides a detailed account on progress or lack thereof on the 556 official proclamations stated in the governing Sierra Leone People’s Party (SLPP) manifesto – the New Direction; the speech delivered by HE the President in his first state opening of parliament ;and executive orders issued by State House in the last one year. 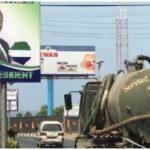 It is therefore an appraisal of President Bio’s first year in office. 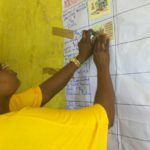 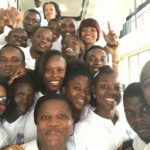 The Bio-Meter is funded by the Open Society Initiative for West Africa (OSIWA) as part of a wider effort in West Africa to create platforms for constructive state-citizen dialogue that will enhance the responsiveness of government to meet the needs of people they vow to serve.